This is a guest post by Daniel Wong of Living Large. “Put your notes away. It’s time to take the test,” says your teacher. You feel paralyzed by fear. As your teacher places the test paper on your table, your mind goes blank. Through my work, I’ve had the privilege of interacting with thousands of students. It’s important to assess students’ learning, but surely tests and exams shouldn’t elicit so many negative feelings? Education today isn’t characterized by a sense of discovery and exploration. Neither is it characterized by a spirit of curiosity. Instead, it’s characterized by fear. Fear of losing out. Fear of exams. Fear of disappointment. Fear of failure. This is understandable. After all, we live in a society that places a heavy emphasis on performance and achievement, so parents have high expectations of their children. But teachers have a role to play too. Please don’t get me wrong; I greatly admire the work that teachers do. My friends who are teachers are some of the most generous, kind and conscientious people I know. Personally, I don’t have what it takes to do a teacher’s job. To all of you teachers out there who are reading this: Keep up your excellent work! “… the fear of failure begins in the teacher. That’s the root of the issue in our education system. 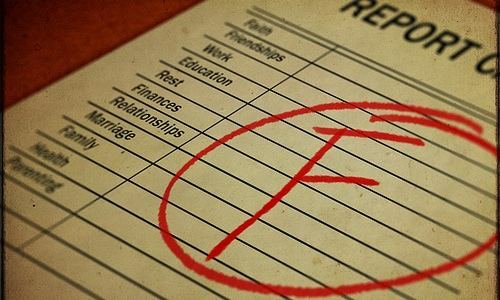 One of the indicators to measure a teacher’s performance is the student’s grades. More often than not, the teacher is blinded to the student’s fear of failure because it is more daunting to come to terms with the fact that the fear stems from us [teachers]. Teaching is a noble calling, but—based on my friend’s observations—teachers do have a significant part to play in causing students to fear failure. Is your life meaningless if you don’t have a university degree? I recently spoke to a teacher (I’ll call him Michael) who spent several years teaching at a high school where the students weren’t academically inclined. Their lives will never amount to much. It bothered me that those words came out of Michael’s mouth so naturally, so effortlessly, so smoothly. Michael spoke as if he was proclaiming a gospel truth: If you’re not a university graduate, your life will never amount to much. I don’t believe this to be true at all. Each of us is running a race, but the goal shouldn’t be to finish first. Rather, the goal should be to finish well, to lead a meaningful life that you can be proud of and to make a difference in the lives of others. I wonder how many teachers share Michael’s sentiments? I’m concerned that the teachers who do might just give up on their students who don’t demonstrate an aptitude for academic subjects, even though these same students might be gifted in other areas like art, athletics, music or dance. Teachers who believe that education is mainly about accumulating certificates, diplomas and degrees are going to instill in their students a fear of tests and exams. Eventually, their students will fear learning, because learning has become so closely linked to those terrifying exams. Truly, all of us are worth so much more than the educational qualifications that we write down on our résumé. In order to overcome our fear of failure, we first need to realize that there are three stages in the journey: Approval, Acceptance and Adventure. It should be our goal to make it through to Stage 3 and to remain there. Below are descriptions of each stage, and what you’ll need to do to continually progress. At this stage, students seek the approval of their parents and teachers. Students try to do well in school primarily to make other people happy. They’re afraid of doing badly because they worry about disappointing their parents and teachers. For most of my life as a student, I was at Stage 1. I didn’t see any meaning in education, but I enjoyed winning academic awards and honors. I studied hard just to try and wow others with my achievements. I now see how unhealthy this approach toward education was! I made it from Stage 1 to Stage 2 only when I realized that I wasn’t defined by my grades and achievements. I was a whole human being, so my role as a student was merely one of many roles I had. If you’re at Stage 1, ask yourself why it’s important to you that you gain the approval of others. Do you have insecurities you need to deal with? What’s the root cause of those insecurities? Do you have any unhealthy thought patterns? Are you committed to changing those thought patterns? Who can you talk to about these issues? When you move from Stage 1 to Stage 2, you’ll experience the freedom of taking full responsibility for your life, instead of trying to live up to other people’s expectations. Stage 2 is where students begin to accept themselves fully—their strengths, talents, shortcomings and inadequacies. They become more purpose-driven in their pursuits, and aren’t so fixated on their performance. To continue to make progress toward overcoming your fear of failure, declare to yourself daily that—even though your academics are important—your identity isn’t based on how many accomplishments you rack up. Instead, your identity is found in who you’re becoming as a person, and in the decisions you make. At Stage 2, it’s crucial that you surround yourself with encouraging people. Don’t hesitate to ask your family and people close to you to support you. I also encourage you to develop your own personal definition of success, and write it down. Refer to it daily and ask yourself how you can lead a life of both success and significance. When students begin to see education as an adventure of discovery, they become intrinsically motivated. They work hard to be the best they can be, instead of trying to be better than their peers. At Stage 3, students see failure not as something to be feared, but rather as something to be embraced. They understand that failure is an integral part of the success journey. Given that we live in a stressful, competitive society, it’s easy to regress from Stage 3 to Stage 2, or even Stage 1. Thus, when you reach Stage 3, it becomes even more important to surround yourself with like-minded people. Stage 3 is about becoming a lifelong learner. Set a rule for yourself of learning at least one new fact a day or reading one book a month. You could make it a habit to try out a new hobby every three months, or watch one educational TV program a week (no, MTV doesn’t count). When you do these things, school will become more fun and interesting too, because you’ll see more clearly the beauty of this amazing world we live in. The fear of failure is something we all struggle with. It’s a battle that begins at a young age, and it’s one that will probably last a lifetime. But that doesn’t mean we shouldn’t equip ourselves with the skills and mindset necessary to fight a winning battle. Let’s feel the fear but face it bravely anyway. Whenever we talk about education, let’s not forget that students’ well-being is at stake. Lives are at stake. The future of our country and our world is at stake. So let’s get to work on this thrilling journey of conquering our fear of failure. About the Author: Daniel Wong is the bestselling author of “The Happy Student: 5 Steps to Academic Fulfillment and Success”. He blogs regularly on topics related to education and career at www.Daniel-Wong.com. Download his popular FREE ebook, “The Unhappiness Manifesto: Don’t Do These 150 Things If You Want To Be Happy”.